Katie Derham presents Ravel's one-act opera L'enfant et les sortileges conducted by Charles Dutoit and recorded in Geneva in October 2015. Katie Derham presents Ravel's haunting one-act opera L'Enfant et les sortileges, recorded in Geneva last October, conducted by Charles Dutoit. The plot centres on a naughty child who in a fit of temper breaks his toys and furniture and hurts the animals around him. These characters come to life to reproach the boy for the destruction he's caused. 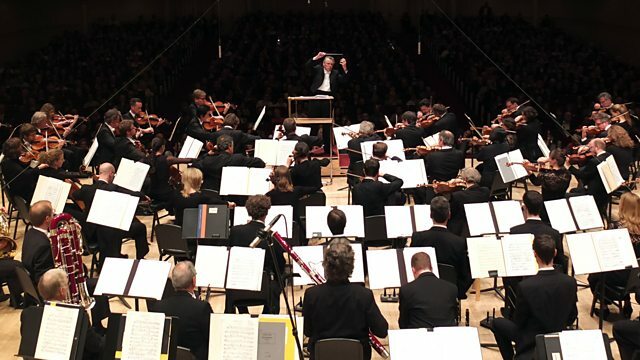 Followed by more for this week's featured orchestra, the Bavarian Radio Symphony. Members of the Bavarian Radio Symphony. Singer: Khatouna Gadelia. Singer: Hanna Hipp. Singer: Daniela Mack. Singer: Kathleen Kim. Singer: Julie Pasturaud. Singer: David Wilson‐Johnson. Singer: Elliot Madore. Singer: François Piolino. Choir: Grand Theatre of Geneva Chorus. Orchestra: Orchestre de la Suisse Romande. Conductor: Charles Dutoit. Performer: Denis Matsuev. Orchestra: Bavarian Radio Symphony Orchestra. Conductor: Mariss Jansons. Orchestra: Bavarian Radio Symphony Orchestra. Orchestra: L'Accademia Giocosa. Singer: Anna Prohaska. Orchestra: L'Accademia Giocosa. Performer: Peter Kofler. Orchestra: L'Accademia Giocosa. Singer: Anna Prohaska. Performer: Peter Kofler. A Child is grumbling as he does his homework; he plots naughty deeds. His Mother enters to check on him. She is cross that he has done nothing but spatter the carpet with ink; he responds by putting out his tongue. His punishment is dry bread and tea without sugar while he considers his behaviour. Left alone, the angry Child gives way to naughtiness. He knocks the Teapot and Chinese Cup off the table. He pricks the caged Squirrel with his pen nib. He pulls the Tom Cat’s tail. He pokes the Fire and kicks the kettle over. He breaks the pendulum of the Grandfather Clock. He tears up his books. He vandalises the painted figures on the wallpaper. As he prepares to fling himself into the Armchair, it hobbles away. Now the room comes alive. As the Child watches, the Armchair joins with the Chair, both demanding their freedom from him. The Grandfather Clock complains at the damage done to him. The Teapot and Chinese Cup threaten revenge and dance off. Feeling cold, the Child approaches the Fire, who tells him that he warms the good but burns the bad. The Child has offended the household gods that protect him. He begins to feel afraid. The wallpaper figures, including the Shepherd and Shepherdess, mourn their destruction. The Child weeps. Out of one of his torn books rises the Princess, complaining that he has wrecked the story she was in; he is too weak to rescue her from her enchanter and she sinks underground. Little Old Man (Arithmetic) arrives and he and his Numbers bombard the Child with questions. The Tom Cat, emerging from beneath the Armchair, spits at him and joins with the female Cat in drawing the Child into the garden. A Tree groans at the wound the Child inflicted on him the day before. Feeling pity, the Child lays his cheek against it. The garden begins to teem with life. The Dragonfly searches for his mate, whom the Child regretfully admits he caught and pinned to the wall. The Bat tells him he has killed the mother of his children. The Squirrel warns the Frog against the cage the Child will put him in. He realises that the animals love each other, but not him. The Animals and Trees unite in a desire for revenge. They throw themselves upon him. A Squirrel is injured. The Child binds his paw with a ribbon. The animals notice that he, too, has been hurt. Concerned, they surround and tend him. As a light goes on in the house, the animals withdraw, praising the Child’s new found wisdom and kindness. Holding out his arms, the Child calls for his mother.